A “Golden Oldie” from 2008. Hi everyone. My name is Jeannine and I am an old member of this site. I haven’t been on it since 2003 because I thought my problems were over. Obviously, this is not the case. I am a 49…soon to be 50. I’ve been married for 29 years and have two sons(26 & 20) and one daughter-in-law. After 3 long years of being told I was crazy and lazy, and searching for answers for my rapid weight gain, fatigue, and lots of other weird symptoms, an adrenal adenoma was accidentally discovered when having a CT scan before my hysterectomy. After initial testing, I only had very mild elevations in a few tests and negative results in most others. I was told to wait and watch. As the year progressed, I became sicker and heavier. I begged, demanded and finagled tests, still only to be told I just “wasn’t sick enough.” One year and 100 lbs. later, my 24 hr. urines were finally high enough to convince the dr. to do surgery. My test results were never very clear and I was never given a diagnosis, even after surgery. The weird part about my test results were that I tested positive for a pheochromocytoma as well as for a cortical adenoma. I had my left adrenal gland removed in April of 2003. It was not a pheo and the pathology listed “adrenal cortical adenoma”. I never had to have any hormone replacement, and aside from not losing the weight and becoming insulin resistant, I was cured. I couldn’t lose the weight on my own, so I joined Optifast, the medical liquid diet program. Over the course of about 6 months, I lost 60 lbs. Then, a few weeks ago, I went to a new opthamologist to have my eyes examined. I mentioned to him that I sometimes got weird visual symptoms with blurry lines in my eyes. 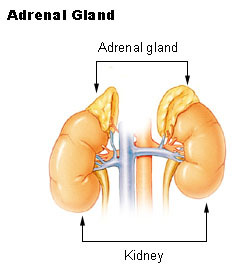 I had first noticed them a few months after my adrenal surgery four years before and they had continued to occur sporatically ever since. I had my eyes examined twice during these last 4 years and nothing was ever shown to be wrong. The new dr. suspected occular migraines, but because of my history with the adrenal tumor, he decided to do a cranial MRI. Lo and behold, I was just diagnosed with a 3-4mm pituitary tumor. So…..here I am, back on the boards looking for answers. I have an appt. in three weeks to see my endocrinologist and the testing will begin.